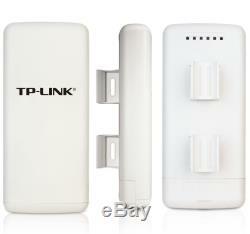 TP-LINK High Power Wireless Outdoor AP. The TL-WA5210G 2.4GHz High Power Wireless Outdoor CPE is dedicated to WISP CPE solution and long distance wireless network solutions. It integrates the functions of a Wireless Access Point, WISP Client, high gain antenna and weatherproof enclosure. It features 12dBi high gain antenna, high output power and high RX sensitivity can significantly extend the transmission range to deliver a more stable wireless connection. Weatherproof Design, Durable Outdoor Solution. The TL-WA5210G is designed to work in harsh outdoor environment. Built with outdoor weatherproof enclosure and high durable of temperature (-30°C70°C) hardware inside, the AP could work in some place with extreme bad weather conditions. Besides, the built-in 4000V lightning and 15KV ESD protection design would also help you to to prevent storm/lightning surges and ensures reliable operation. High Power & Receive Sensitivity. Long Distance Outdoor, Break the limitation of WiFi. The TL-WA5210G features 12dBi dual-polarized antennas which is the key feature to build long distance WiFi connection. With software ACK timeout adjustable by setting the distance between two APs, it allows you to adjust the timeout value up to 15km(9.3miles) for outdoor long distance operation, or even 52km(32.3mile) with higher gain antenna support. Multiple Applications, Available in Various Industries. Supports AP Client, Client Router, Bridge, Repeater, AP and Gateway operation modes to enable various wireless applications to give users a more dynamic and comprehensive experience when using their AP. Especially in AP Client Router Mode for WISP CPE, the AP will behave as a client of the Wireless Internet Service Provider (WISP). However, router functions are added between the wireless WAN side and the Ethernet LAN side. Therefore, the WISP subscriber can easily share the WISP connection with only a simple switch. PoE Supported for More Flexible Deployment. The TL-WA5210G is able to be powered using an Ethernet cable to simultaneously send data and electricity to wherever your AP may be located even up to 200 feet away. This feature multiplies your options allowing you to place the AP in a position that is most convenient to get the best signal possible, such as on the wall or on the ceiling of your office. Complies with IEEE 802.11b/g, wireless speed up to 54Mbps. Weatherproof Design durable housing for reliable use even in harsh outdoor conditions. 4000V lightning/15KV ESD protection design. 12dBi dual-polarized antenna to build long distance WiFi connection. High Power to boost your signal coverage and link speed. Passive Power over Ethernet (PoE) for flexible deployment. High output transmission power and reception sensitivity optimized. Supports Passive Power over Ethernet. Supports AP Client Router, AP Router and AP operation mode. Distance Adjustment for long range transmission, up to 50km(31.1 miles). Supports Layer 2 User Isolation. Provides throughput monitor indicating the current wireless throughput. Provides WEP, WPA/WPA2, WPA-PSK/WPA2-PSK data security. Provides external RP-SMA connector for higher gain antenna upgrade. 1 10/100Mbps Auto-Sensing RJ45 Port(Auto MDI/MDIX, PoE) 1 External Reverse SMA Connector One Grounding Terminal. 12VDC / 1.0A Linear PSU. IEEE 802.11g, IEEE 802.11b. Dimensions (W x D x H). 10.4 × 4.7 × 3.2 in. 15kV ESD Protection, 4000V Lightning Protection Grounding Terminal Integrated. 11g: Up to 54Mbps(dynamic) 11b: Up to 11Mbps(dynamic). <20dBm (EIRP, For countries using CE Standards) <27dBm (Peak Output Power, For countries using FCC Standards). 802.11g 54M: -76dBm 48M: -78dBm 36M: -82dBm 12M: -91dBm 9M:-92dBm 802.11b 11M:-90dBm 5.5M:-92dBm 1M:-98dBm. AP Router Mode AP Client Router Mode (WISP Client) AP/Client/WDS Bridge/Repeater mode. SSID Enable/Disable MAC Address Filter 64/128/152-bit WEP Encryption WPA/WPA2/WPA-PSK/WPA2-PSK (AES/TKIP) Encryption. 15km with Integrated Antenna 50km Maximum (High gain directional antenna required). Up to 196.9feet (60 meters) PoE is supported Provides 4-level signal LED indicator. TL-WA5210G Power Supply Unit Power Injector Resource CD Quick Installation Guide. Microsoft Windows 98SE, NT, 2000, XP, Vista or Windows 7, MAC OS, NetWare, UNIX or Linux. Operating Humidity: 10%90% non-condensing Storage Humidity: 5%95% non-condensing. Postal Service depending on their size, weight. The item "TP-LINK 2.4GHz High Power Long Range Wireless Outdoor Access Point AP TL-WA5210G" is in sale since Friday, March 02, 2012. This item is in the category "Computers/Tablets & Networking\Home Networking & Connectivity\Wireless Access Points". The seller is "fourpairteledata" and is located in Arkansas. This item can be shipped to United States, to Canada, to United Kingdom, DK, RO, SK, BG, CZ, FI, HU, LV, LT, MT, EE, to Australia, GR, PT, CY, SI, to Japan, to China, SE, KR, ID, to Taiwan, ZA, TH, to Belgium, to France, to Hong Kong, to Ireland, to Netherlands, PL, to Spain, to Italy, to Germany, to Austria, RU, IL, to Mexico, to New Zealand, PH, SG, to Switzerland, NO, HR, TR, BR, CL, CO.